Thanks for the response RockoRocks. The Virus program I'm using is called Kasperski. Kasperski Website What I will advise is that when trying to download the download is blocked as it tries to install adware to my computer. So I had another go without the visrus protection enabled, it downloaded alright but when installing, various adware programes were installed instead so I didn't know if Serenity was installe at all. 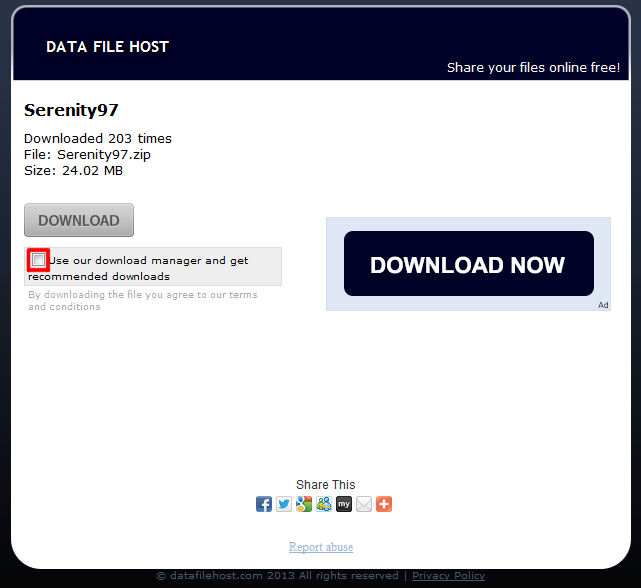 Perhaps another method for your downloads may be warranted. Did you remember to uncheck this box? Because I can assure you that his files by themselves are malware free. Their downloader is probably the culprit. Well if they did then they're funding datafilehost. It clearly says ad, not in bold but it does say it. That may have well been the case. I'll try again and see what eventuates. Pretty tricky though to have 2 download buttons. DoctorOfSpace, put this screenshot in the main post in download instruction, to prevent such issues in the future. Or find normal hosting, say Google Disk. One of the moderators will have to do that. Copying the image link on a small phone screen is a pain. Currently don't have internet anyways so I won't be adding new ships even after 971 comes out. One of the moderators will have to do that. It will in the next version. When I downloaded your files, it got me an installer, I thought okay, that's fine. The first one was going okay, until I realized it had installed malware! Some "Search by conduict" thing. Malwarebytes remvoed the trojans. Could I have a direct link to the 7zip file? There is a nice big warning so reading does help. Added more stuff as well. Maybe move it to the top of the OP,.